Sean P. Sullivan - Washington Wine Report: Calling All Wine Bloggers: WBC-or-Bust! Yesterday local start-up WineCHATr.com announced a contest called WBC-or-Bust: Road to Walla Walla. 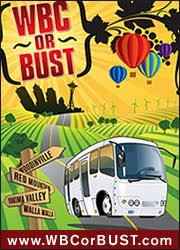 The contest, which leads up to the 2010 Wine Blogger's Conference in Walla Walla June 25-27, will give 12 citizen wine bloggers a ride from Seattle to the conference. The all expenses paid trip will take place over three days and two nights making stops in Woodinville, Red Mountain, and Yakima Valley before arriving in Walla Walla. “Washington is a premier wine region and a road trip just sounded like a fun way to get visiting bloggers where they needed to go, while sharing a broader Washington experience including it’s wine, food, and landscape,” says Marcus Pape, founder of WineCHATr.com. Traveling on the bus with the bloggers will be a video crew, wine media professionals, and industry leaders. The contest begins October 26th and runs through April 23rd. For more information on the contest and to sign-up go to www.wbcorbust.com. Note: Qualifying participants must have an existing wine blog at the start of the campaign, October 26th, in order to be eligible. Washington residents/bloggers are exempt from participating in the contest.